Swindon's reward for knocking out holders Southampton in the first round of the Johnstone's Paint Trophy is a home tie with Torquay in round two. 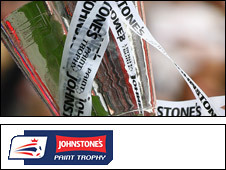 Past winners Carlisle, who lost in the 2010 final, and Port Vale meet in the northern section while Sheffield Wednesday host neighbours Chesterfield. Leyton Orient entertain Brentford in a London derby in the southern section while Charlton travel to MK Dons. The ties take place in the week beginning 4 October. Northern section (west): Accrington v Stockport, Macclesfield v Crewe, Bury v Shrewsbury, Carlisle v Port Vale. Northern section (east): Burton v Rotherham, Hartlepool v Bradford, Sheffield Wednesday v Chesterfield, Huddersfield v Peterborough. Southern section (west): Bristol Rovers v Aldershot, Swindon v Torquay, Cheltenham v Plymouth, Hereford v Exeter. Southern section (east): Colchester v Wycombe, Leyton Orient v Brentford, MK Dons v Charlton, Barnet v Southend.